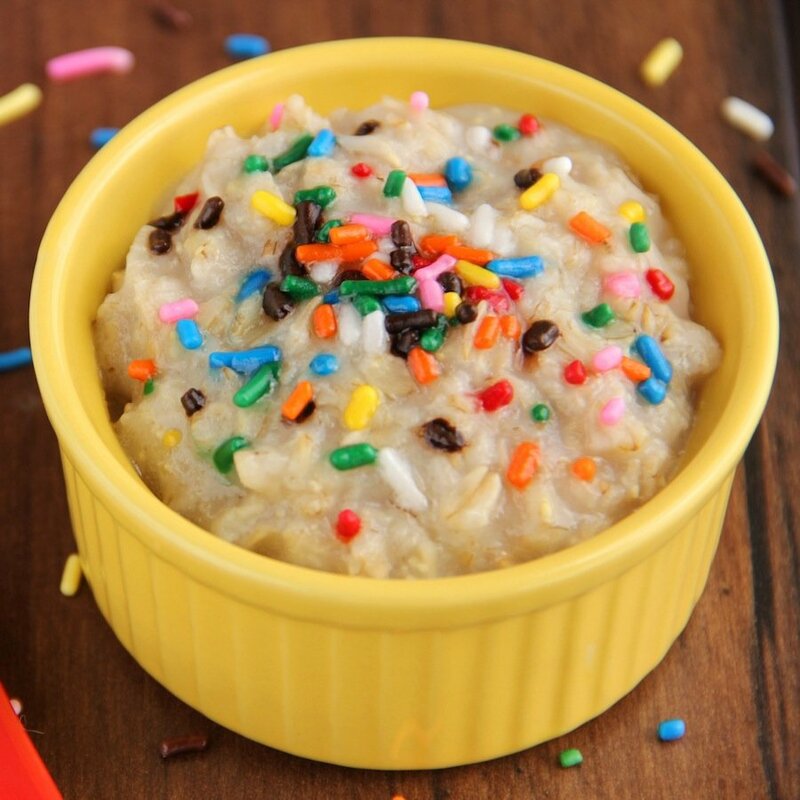 An easy recipe for a healthy, low-calorie oatmeal that’s packed with protein and actually tastes like dessert! I bit off way more than I could chew on Tuesday. I overslept, adrenalin waking me up in a heartbeat when I spotted the clock flashing the time—2 hours later than I expected. I spent all morning and afternoon running around in circles faster than our dog when she chases her tail, desperately trying to catch up and speed through my “To Do” list. I needed 5 more sets of hands and an extra 24 hours in the day… That must be how it feels to be a mom! At 9 pm, with a batch of yeast treats finally rising in the oven (recipe coming soon!) and Olena’s turkey chili simmering on the stove, I nearly suffered a heart attack for the second time that day… I ran out of maple syrup, something incredibly crucial to my photo shoot the following morning. I breathlessly begged my guy to watch the pot as I grabbed my keys and sprinted out the door. As I impatiently hefted my basket from one hand to the other, snippets of the cashier’s conversation drifted my way. “Yeah, I was a pastry chef,” he casually mentioned. “Why’d you stop and come work here?” the girls inquired. At any mention of baking, my sensitive ears go on high alert, like a dog listening for squirrels in the park. Although the teenagers changed the topic, I brought it right back up when I reached the register. “So you were a pastry chef?” I inquired, and we started chatting while he scanned and bagged my items. Despite his laid-back tattooed, pierced, and bushy bearded appearance, it turned out that he studied at one of the three elite vegan/vegetarian pastry schools in the nation and was immediately hired at the #10-ranked restaurant in the country. He eventually quit and wandered halfway across the US to our sleepy little town, but he still owns molecular gastronomy equipment and plays around with creating fruit juice caviar in his spare time. 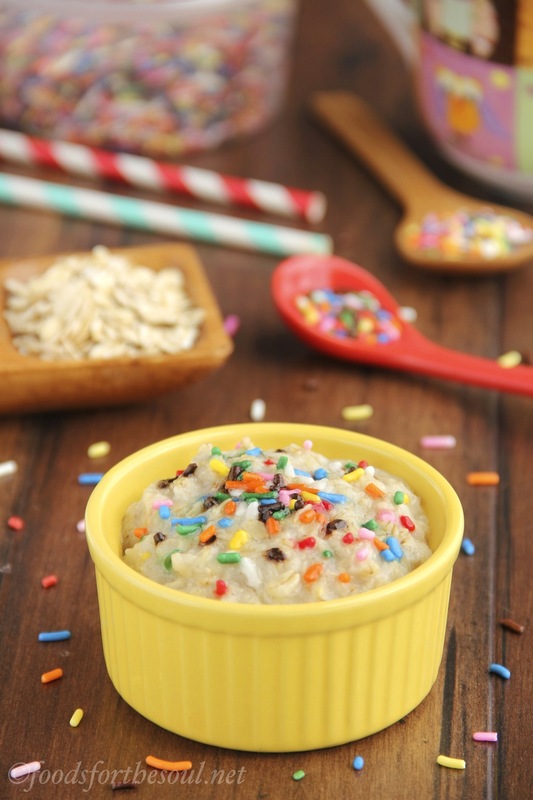 Just like that cashier’s life story, this Skinny Funfetti Cake Batter Oatmeal is colorful, fun, and bound to bring a smile to your day! Its sweet, buttery taste tricks you into thinking you’re acting naughty and eating dessert for breakfast, but your waistline will still thank you—it clocks in at under 175 calories and packs in 9 grams of protein! When choosing sprinkles, I suggest using jimmies (the long thin ones) as opposed to colored sugar or nonpareils (the tiny spherical ones). The latter two tend to bleed and create a rather unappetizing gray color, whereas jimmies generally do not. 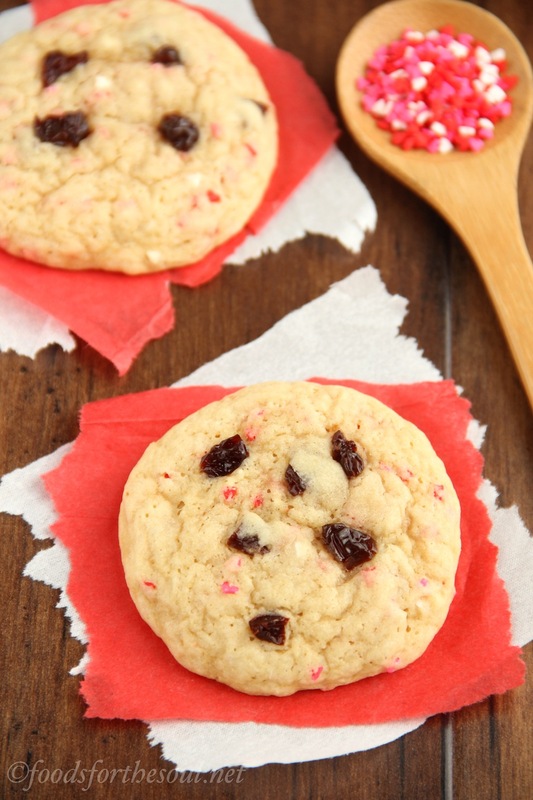 And if rainbow isn’t your thing, try chocolate or a holiday-themed mix instead! When I cook oatmeal, I almost always turn to the microwave. As long as I watch the bowl and open the door whenever the oats threaten to bubble over the rim, there’s a lot less to clean up! (Yes, I’m lazy and don’t want to wash a bowl and a pot from the stove.) 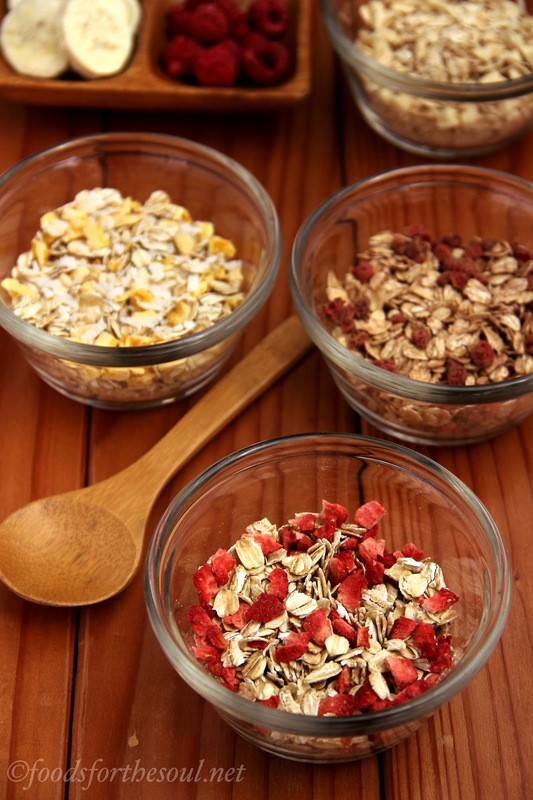 But make your oatmeal with whatever method you feel most comfortable. 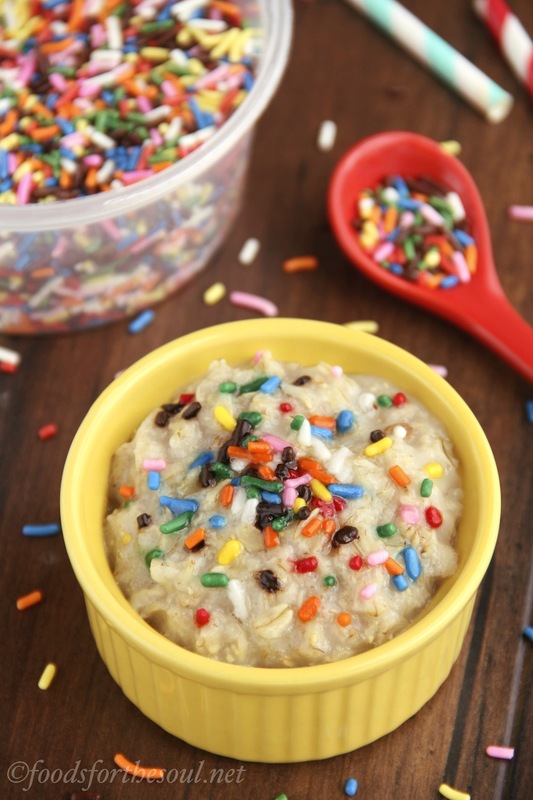 You could even combine everything but the sprinkles the night before and make overnight oats instead! Once the oatmeal finishes cooking, stir in the butter extract and allow the bowl to thicken for a few minutes before adding the sprinkles. This reduces the chance of them bleeding into the oatmeal. Then dig in and enjoy! 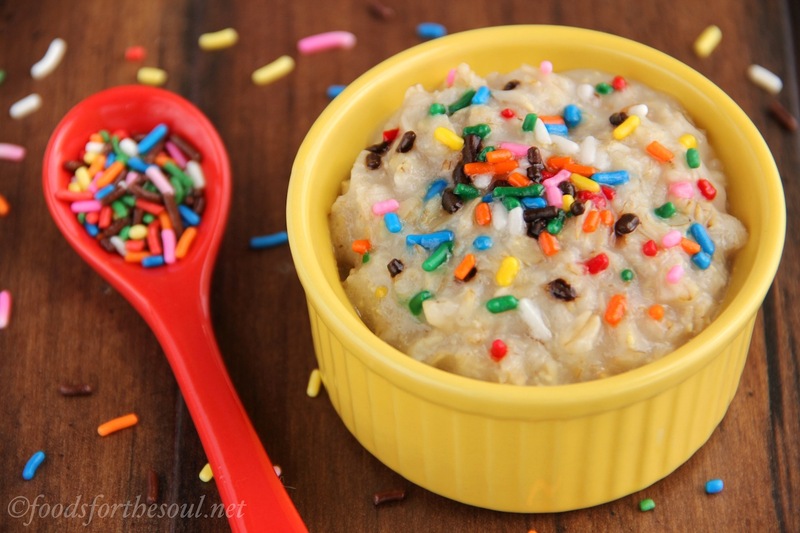 After my first spoonful of this Skinny Funfetti Cake Batter Oatmeal, I literally thought I was eating dessert for breakfast. 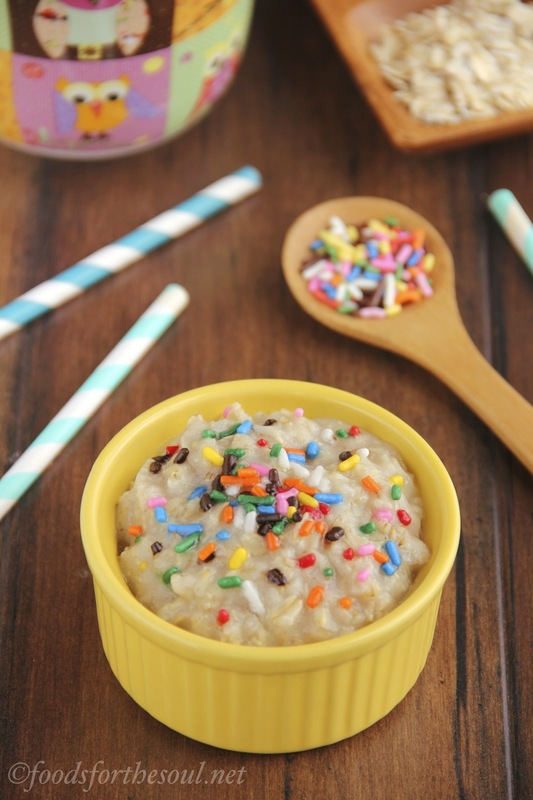 The warm buttery flavor… The thick cozy oatmeal… The cheerful rainbow sprinkles… They totally fooled my taste buds and my stomach, but I never felt bloated or bogged down later in the day (like during middle school when I actually snuck cake for breakfast—but shh, don’t tell my mom!). Guys, you really should try this for breakfast. ASAP. Then wash it down with a skinny chocolate covered strawberry frappuccino. Just sayin’… It’s the best healthy breakfast of champions! 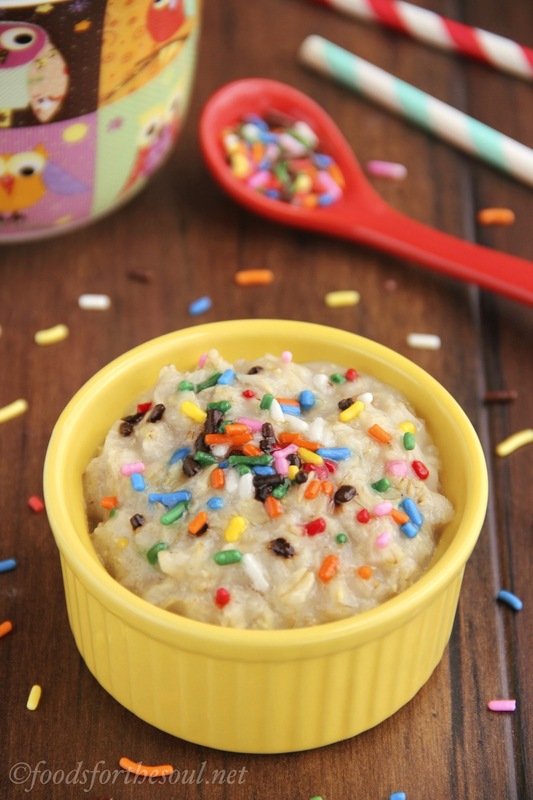 This thick buttery oatmeal really tastes like cake batter! The recipe is easily doubled, tripled, or quadrupled to feed more than one. Add the oats and milk to a bowl and cook on HIGH in the microwave for 2 ½ to 3 minutes, or until most of the liquid has been absorbed. (Alternatively, cook on the stovetop over medium-low heat for 5 minutes, stirring frequently until most of the liquid has been absorbed.) 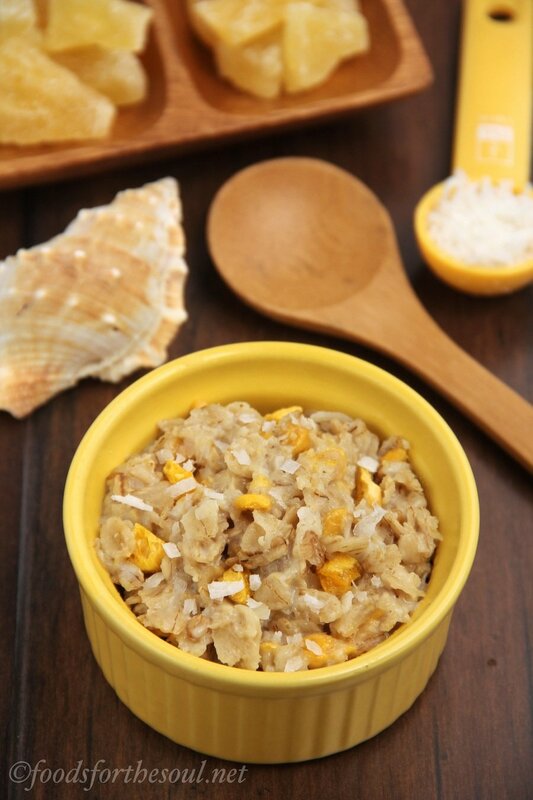 Stir in the butter extract, and let the oatmeal sit for 1-2 minutes to thicken. Sprinkle the jimmies on top and serve immediately. Notes: For a vegan version, substitute your favorite non-dairy milk OR water. 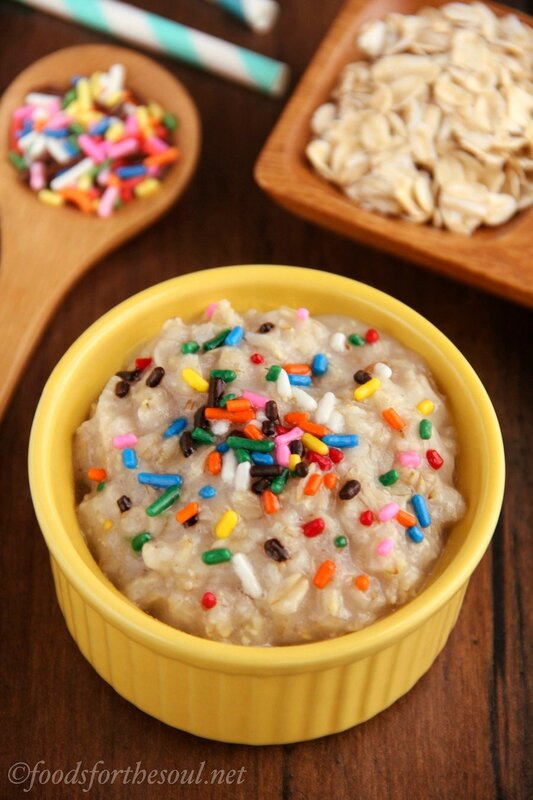 To make an overnight oats version, mix everything together except the rainbow sprinkles in a bowl with a lid, and refrigerate overnight. 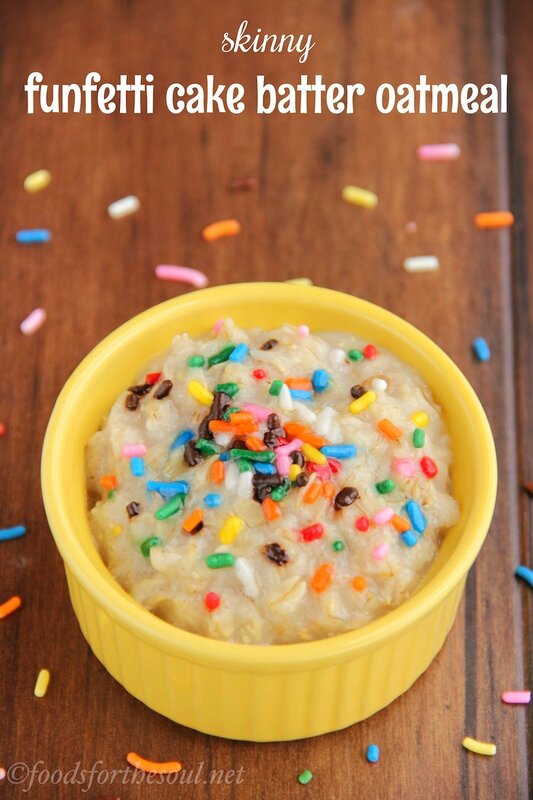 Add the sprinkles in the morning just before eating. Is there any sort of replacement for the butter extract? 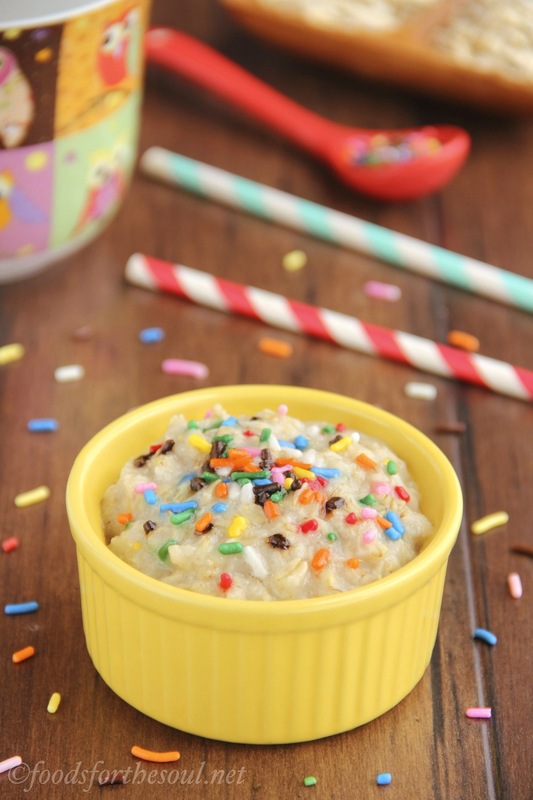 You can substitute vanilla extract, but the oatmeal won’t have that classic “cake batter” flavor. 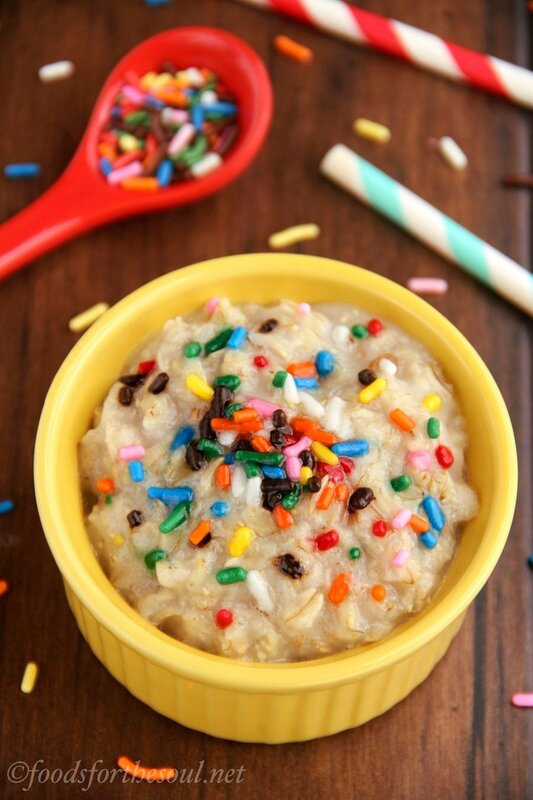 It’ll just taste like regular oatmeal with sprinkles. 🙂 I can’t wait to hear what you think of this recipe if you try it Angela! I made the overnight version with unsweetened vanilla flax milk.+ protein. I liked the flavor, but the texture wasn’t quite as thick as I would have liked. The sprinkles I added were also kind of crunchy, which was a little strange! Overall, though, I liked it.